Everyone always asks “how do you dispose of warehouse waste?” and I tell them, “a very common application for overhead chain conveyor systems does just that!” For example the removal of corrugated cartons from the order picking areas of a modern distribution center. In recent years the ‘green’ environmental movements and costs of raw materials such as corrugated paper have changed the way we handle trash cartons that come from our distribution centers. Don’t forget corrugated material is worth some money if it’s prepared so that it is easy for a recycler to pick up and process. An overhead conveyor efficiently takes empty trash cartons from the source to the trash compaction system. 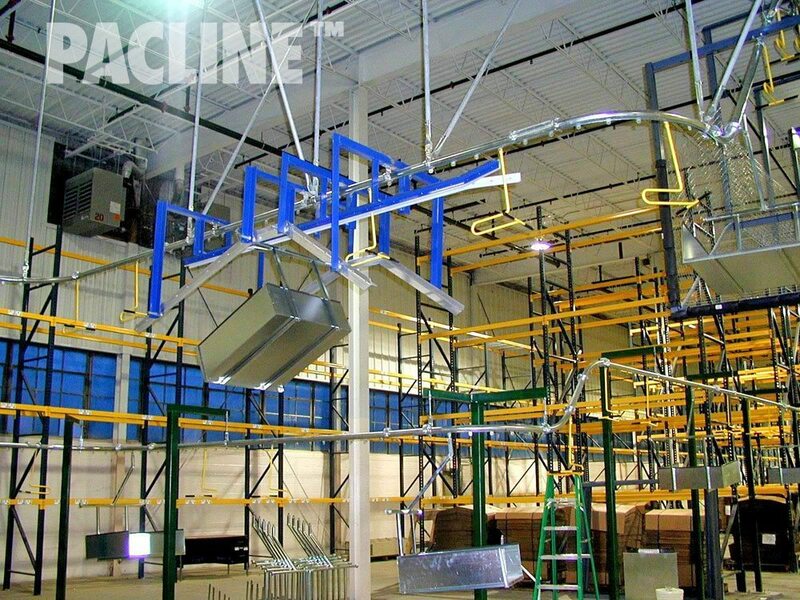 An overhead conveyor utilizes overhead space and allows for the conveyor to wind through areas close to workers, which allow them to seamlessly place the trash cartons onto conveyor “hooks” or “trays”. I recently spoke to a fellow who suggested he would actually supply the entire conveyor system for free if the customer could consistently generate a minimum supply of the corrugated material for his use.